Ashley and her partner, Corbin, have started a weekly waffle tradition: Waffle Wednesdays! And so in that spirit, for Vegan MoFo, we’d like to present you with a today’s Wednesday Waffles: they’re vegan, they’re gluten-free, and they’re Pumpkin Cornbread Waffles!!!! I wanted to try a cornbread waffle, using masa harina (which I’ve got in the cupboard from making those Homemade Corn Tortillas & Arepas — and I am so pleased with the result! A sweet/savoury waffle, moist from the pumpkin, and full of pumpkin spice fall flavours from the Chai Spice Mix. 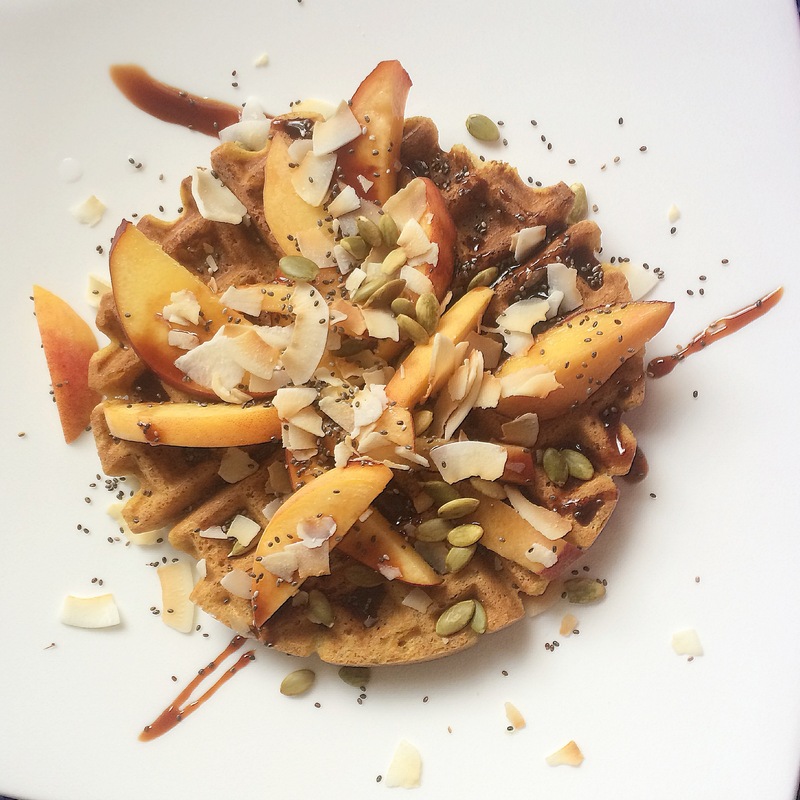 The sweet-treat waffle above is topped with fresh Ontario peaches, date syrup, toasted coconut, pumpkin seeds, and chia seeds. 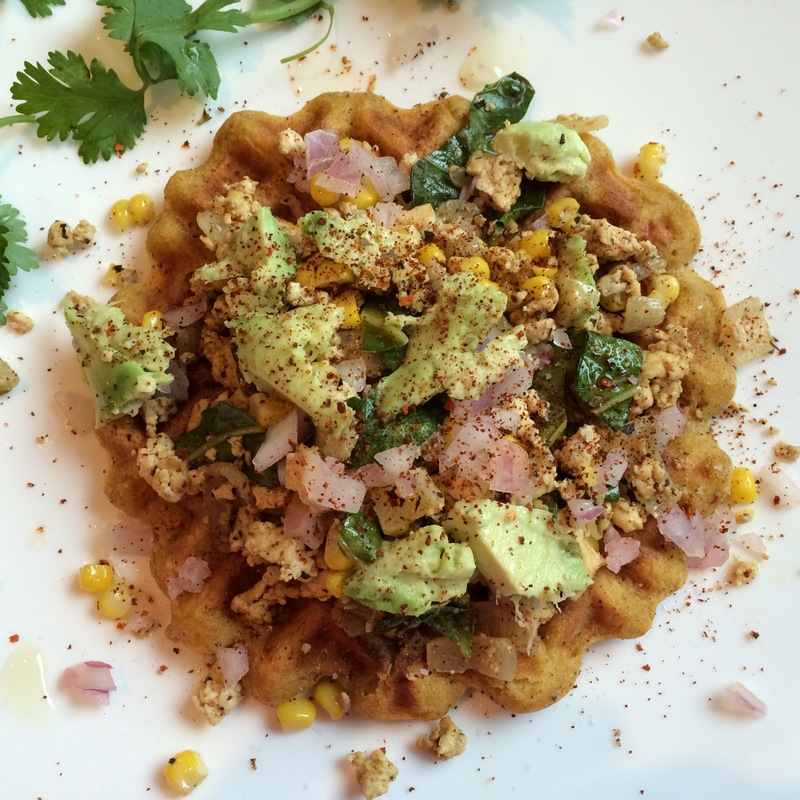 And you can also make a savoury cornbread waffle to power your workouts — I topped this one with leftover Tofu Scramble from our Vegan Breakfast Tacos, red onions, fresh avocado, cilantro, lime juice & chili flakes. 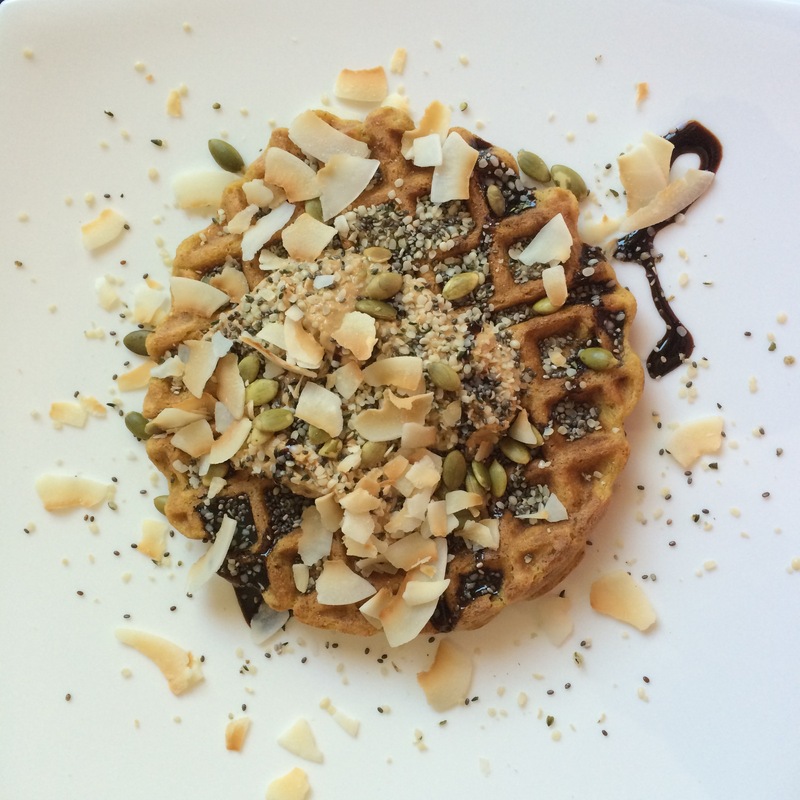 And if you want to go half-way in between a sweet-treat-waffle and a power-workout-waffle, my standard breakfast waffle topping is perfect: a big scoop of cashew butter, 2 teaspoons of molasses, whatever fresh fruit you have on hand, and a handful of toasted coconut, hemp seeds, chia seeds, and pumpkin seeds. I’m actually thinking of making a new batch of scrambled tofu just to go with my new waffles! It was SUCH a delicious savoury combination! Whichever way you enjoy it — Happy Waffle Wednesday!!! These waffles are like cornbread: slightly sweet, but equally good with savoury or sweet toppings. They also freeze incredibly well, especially if you reheat them in the toaster oven. I like to make a big batch of waffles on the weekend, and eat them from the freezer for the rest of the week. These waffles are now going into the regular freezer rotation! Makes 8 waffles. In a large bowl, whisk your dry ingredients together (masa, baking powder, chia, chai spices, and salt). In a separate bowl, combine your wet ingredients (pumpkin, maple syrup, coconut oil, and 2 1/2 cups almond milk). Whisk the dry ingredients into the wet ingredients, until there are no lumps remaining. Let the batter sit for 30 minutes. It will be thicker than standard waffle batter. If necessary, add the extra 1/2 cup of almond milk to thin out the batter. Preheat your waffle iron, and cook according to the manufacturer’s instructions (I like to use 1/3 cup of batter for each waffle, at the highest setting on my waffle iron). As each waffle is cooked, move it to a wire rack, or top with delicious things & eat immediately! Yum! Pumpkin waffles sound so delicious for this time of year! Thanks for sharing! I’m totally ready for anything pumpkin right now 🙂 Enjoy! That sounds amazing!! Must go find masa harina. What a delicious plate! 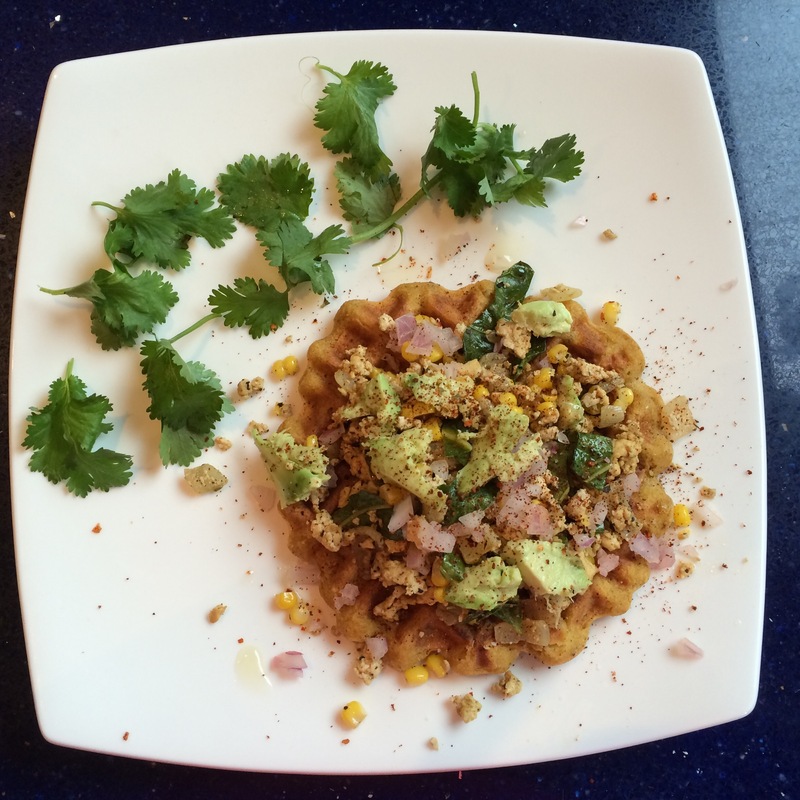 We just made corn tortillas with jalapeños last night and I want to try this out in waffles!